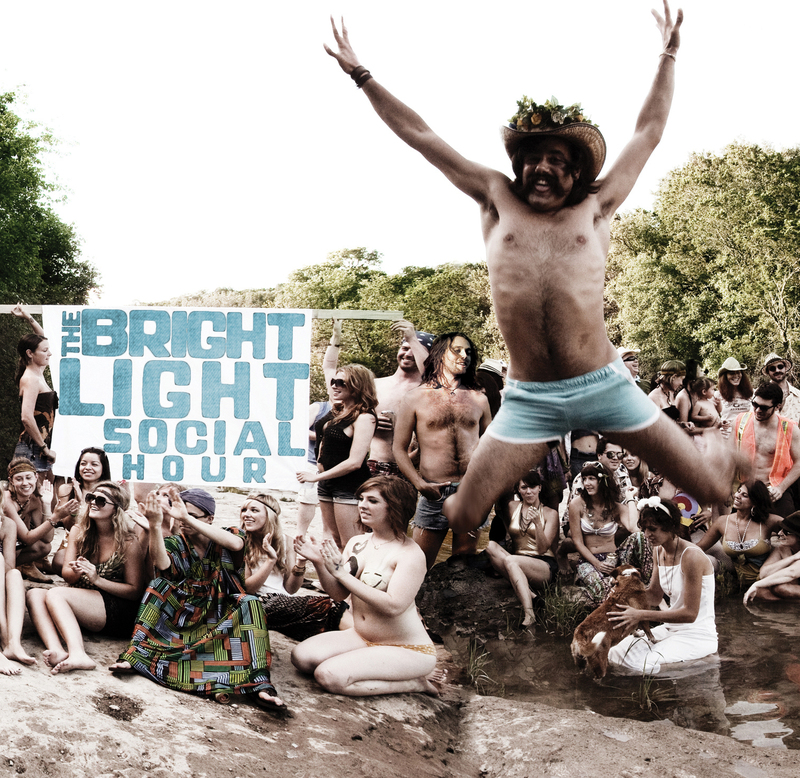 Austin, Texas based band The Bright Light Social Hour, who recently played at MidPoint Music Festival 2011, will be returning to Cincinnati for a show at the MOTR Pub next Thursday, January 12th. The band had a momentous rise in 2011 highlighted by touring in support of their self-titled LP, which was recognized with six Austin Music Awards at SXSW 2011. The band is composed of Curtis Roush (guitar/vocals), Jack O’Brien (bass/vocals/moustache connoisseur), A.J. Vincent (keyboards/vocals), and Joseph Mirasole (drums) and recently took the time to answer some questions from our team here at Thought on Tracks. So please enjoy getting a glimpse into a band that is sure to follow up their success in 2011 with an even bigger 2012. The show at the MOTR Pub next Thursday night is FREE, so get off that couch and start your own personal 2012 concert year off right! First off, congratulations on your self-titled LP and the recognition it received at SXSW 2011 winning Band of the Year, Album of the Year, and Song of the Year for “Detroit”. When I listen to it I hear everything from Southern Rock to funk to psychedelic rock. How would you describe your sound to someone who has never heard you? I guess we’d say southern psychedelic rock? It’s got some soul and deep-funk and hard dance too. What acts did you (and the band) listen to growing up that have influenced your current sound? For instance, I hear some of The Doors with the organ in “Bare Hands Bare Feet”. Am I right on that or just a coincidence? Zeppelin, Daft Punk, Sly & The Family Stone, Slayer, Pink Floyd. Yup, that’s a 60’s Farfisa combo organ similar to the ones Ray Manzarek often played. When I first got the album, the first thing that really stuck out to me was the cover art. Can you give us the back-story here? Because it’s absolutely ridiculous and fantastic in every way. Curt and the art director independently had the idea of creating a sort of rock ‘n’ roll utopia scene, so we invited a bunch of friends out to the Greenbelt in Austin, told them to wear whatever and bring dogs and music and beer and whatever they felt like. The photographer and director would have us move around, but mainly everyone was just gettin down by the water and we later put together all the best shots for the album. Can you go into the process the band takes when making music, specifically, the self-titled LP? Do you play together when you write music and build off each other or separately? How are the lyrics written? A lot of the songs were born out of baby ideas for drum parts, riffs or vocal lines that we would then jam on extensively. When we’d find a feel that excited us, development would turn for that direction, and the process would gradually move from one of improvisation to one of refinement. Almost everything is written with the four of us in the room, every detail requiring approval from the entire group. One of us will bring in lyric concepts and ideas with the others giving input until we have something that fits the song. What’s it like to be a band on the road and the inter-band dynamic along the way? What is the Texas music scene like and your band’s place in it? Had you asked me 5 years ago I would have said cowboys, rodeos, and country music, but with other rock acts such as White Denim getting more attention and notable festivals like Fun Fun Fun Fest and SXSW, it seems that the music scene is thriving as much as, and if not more, than Brooklyn. There’ve been incredible acts of all types coming out of Texas for a long time. The Austin scene is crowded but prolific, healthy, and very supportive of its musicians. It’s hard to say what our place is because the scene is constantly growing and changing, but we’re really lucky to be rooted in such a supportive and enthusiastic music community that is happy to help us grow. When will you begin work on your next album and how would you like to see your sound evolve going forward? We’ve been working hard on new material for the next record, but it’s still a ways off. We try to have no preconceived ideas of what the music should sound like. We do our best to guide the songs in the way that feels right, but ultimately they are their own creatures. So far what we’ve got is a bit darker and and thicker, we’re very into it. And the last, and certainly most important question. Which wins in a cage fight and why: Jack’s moustache or Local Natives front man Taylor Rice’s one? Hmm. I bet they could talk it out.